Put chocolate chips and butter in a pan, and melt. (It works best to do this with a double-boiler or with a small pot inserted in a larger one, with the larger pan having an inch of water boiling to heat the ingredients indirectly.) Stir the butter and and chocolate chips together until they are uniform, and then allow to cool. In the meantime, crush the vanilla wafers (it works best to do this with the back of a spoon) and gather them in the measuring cup to the full 1/4 cup. Put them in a bowl and add the powdered sugar, making sure to sift it fully (this is important!). Mix the dry ingredients up together. By this point the chocolate mix should have cooled; add it to the dry mix and combine them evenly. 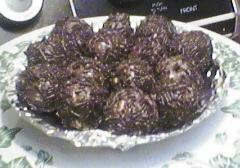 This mix should be handleable; separate out one-inch balls of the mixture and roll each in a plateful of chocolate sprinkles, coating completely. 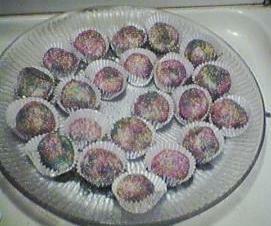 Display them in attractive mini candy cups, and refrigerate for at least half an hour before serving. NOTE: You can make almost the same thing with 8 ounces of white chocolate, 4 tablespoons of whipped cream, and 1 teaspoon of vanilla, rolling it instead in pastel sprinkles to make a spring or Easter truffle. To do this, melt your chocolate and cream together, cool it for 20 minutes, stir in the vanilla, and chill for 1 1/2 hours. This will roll in sprinkles easily the same as the chocolate truffles above. Put them in cups and chill 30 minutes before serving.